On a map of the red-rock country surrounding Sedona and Oak Creek Canyon in north central Arizona, Schnebly Hill Road looks much like any other meandering drive through the region. But it is, in fact, a lesson in time, an opportunity to explore the geological and cultural history of this Technicolor landscape. For 13 miles, the road zigzags eastward out of Sedona to intersect Interstate 17, the highway which connects Phoenix to Flagstaff. En route, it ascends through a series of switchbacks up a mountainside, tracking a fault which reveals ancient sedimentary stratastony layers formed by sand and silt deposited by a primal sea from 330 to 250 million years ago. Over the millions of years, while the North American continent drifted slowly westward (at an average rate of a few inches per year), the sea receded and advanced, creating swamps and coastal deltas along its changing shoreline. Inland, a countermarching desert produced criss-crossing fields of shifting sand dunes, which were inundated with each return of the sea. Over time, the sea and the desert, in an epic contest for the land, produced a complex mosaic of geologic formations as colorful as a painter’s palette. Volcanic eruptions rose from the magmatic core of our planet, blanketing much of the land with flows of lava. As our restless continent moved, the earth’s crust cracked, with one side of the fracture rising relative to the other, exposing long-buried strata of red stone. Immediately, wind and water began chiseling the newly revealed formations, sculpting red-cloaked spires, pinnacles and buttes set against an azure sky. 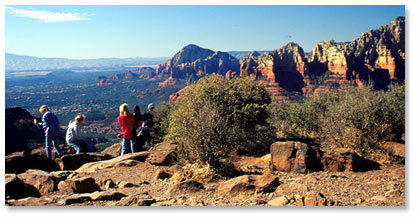 The first white settlers arrived in the Sedona region in 1876. To reach Flagstaff, they had to travel south from Sedona for 11 miles to Beaver Head Station, turn east for several miles, up a mountain, then head north up a road which roughly paralleled today’s Interstate 17. One way, the journey took four days. Much as the waters and winds carved the Red Rock canyons through the geologic formations, the early settlers set out to cut a shorter route  Schnebly Hill Road  through the stony wonderland. With dogged persistence, picks and shovels, and an occasional blast of black powder, those pioneers succeeded in creating the rugged wagon road out of the steep canyon to join a dirt road leading from Phoenix to Flagstaff. Joy Loy had begun the construction in 1896, following a cattle trail blazed by pioneer Jim Mund. By 1901, Loy had scratched out a rough route originally called the Verde Cut-Off Road. A year later, the Coconino County Board of Supervisors awarded a $600 contract to pioneer and Civil War veteran J. J. Thompson to improve the road. His laborers worked 12-hour days, at a wage of $1 per day, to carve a better passage through the mountain. Within six months, the road, then called "Mund’s Road," was complete. The new route reduced the time required to make the trip from the Sedona to Flagstaff from four days to two. Carl Schnebly, who arrived at Oak Creek in 1900, first used the road to transport lumber from Flagstaff to build a two-story, 11-room home, now the site of the world-renowned Los Abrigados resort. Once his home was completed, Schnebly then used the road to transport wagonloads of produce north to Flagstaff and supplies south to his small general store. He also petitioned for a post office, which he proposed to call either "Oak Creek Crossing" or "Schnebly Station," names rejected because they were too long to fit on a cancellation stamp. So Schnebly named the new postal site after his wife, Sedona, who became the namesake for the town. Travelers coming down off the mountain on their way to the Verde Valley would often stop at the Schnebly home, which Sedona converted into an inn. Before long, people associated the road with the Schnebly family, and the route assumed its present name. Traffic on this steep trail declined in 1914, when the even shorter Oak Creek Canyon Road  State Route 89  was completed. Today, Schnebly Hill Road  FS Road 153  remains as a little-changed, primitive ascent up Arizona’s Mogollon Rim, the southwestern edge of the Colorado Plateau. It begins at State Route 179 in Sedona. The first mile deceives the unwary. It’s paved. But it quickly changes into a pock-marked, rutted dirt road. It’s rough. The Forest Service occasionally grades the surface and fills potholes, but high clearance vehicles remain a must, although someone is always challenging Schnebly Hill Road with a passenger car, inevitably littering the trail with metal and oil. Over the next five miles, the dirt road ascends 1,800 feet to Schnebly Hill Vista. Along the way, narrow turnouts provide an opportunity for travelers to marvel at the unfolding landscape. Schnebly Hill Vista, at 6,000 feet, overlooks the Verde Valley and Sedona below the summit, Steamboat Rock at the mouth of Oak Creek, and the mineral-rich Mingus Mountains to the west. Today, Oak Creek Canyon, its colorful stones 330 million years old, is a fragile ecosystem which is threatened by the four million visitors every year. Fortunately, much of the area is protected because it is designated by the Forest Service as wilderness, a total of 140,000 acres in three areas which surround Sedona. To help raise money to manage the area, the Forest Service now charges a parking fee if you want to stop along Schnebly Hill Road, which runs through the Mund’s Mountain Wilderness Area. Red Rock Secret Mountain Wilderness lies to the north and Sycamore Canyon Wilderness, to the northwest. Along Schebly Hill Road you can still see retaining walls built by Loy in 1901. You will find "medicine wheels," cobble stone circles similar to prehistoric sacred monuments in the upper Midwest, just off the road. They are located on gigantic sandstone slabs just before the road switchbacks up to the overlook. They attest to the modern spiritual attraction of the region. 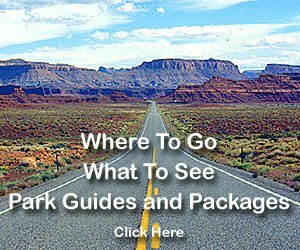 As the road rises from the plateau to Ponderosa pine country, you have an opportunity to see diverse wildlife, including black bears, mountain lions, white-tail deer, canyon wrens and rattlesnakes. Through the forested stretch, the road is lined with historic ranches, grassy cienegas (marshes) and a mountain lake. Seven miles past the vista, the road dead-ends at Interstate 17. You can travel the road in an hour or spend a day on the journey, reveling among the sandstone suite of colors  scarlet, carmine, vermilion, cerise, ruby, claret, magenta, and bittersweet  which have tested artists’ palettes and poets’ vocabularies for decades. The colors change constantly with the passage of the sun, making them, it seems, always just out of reach of the artists. More information about passes is available at the Forest Service website.